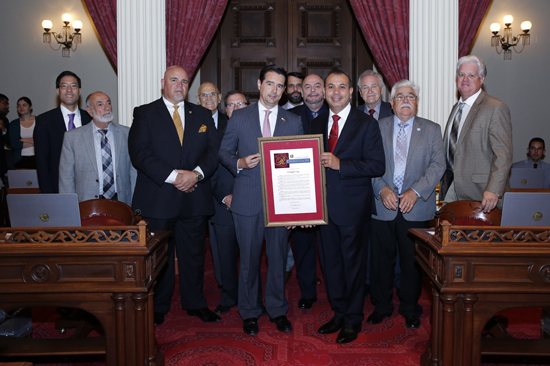 The State Senate today recognized the contributions of California’s Portuguese-American community by adopting Senate Concurrent Resolution 130 by Senator Tony Mendoza (D-Artesia), declaring June 10th as “Portugal Day” in California. A special ceremony featuring the Consul General of Portugal in San Francisco and Portuguese-American dignitaries from throughout the state was held on the Senate Floor following the vote. Full text of SCR 130 may be found below. “Today, the California State Senate paid tribute to the contributions of the Portuguese-American community to the diverse fabric of California. 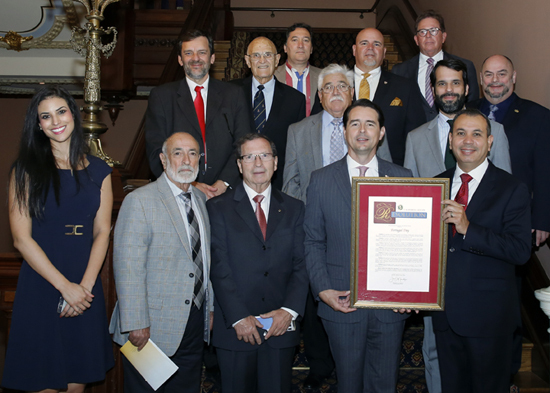 SCR 130 declares June 10, 2016 as “Portugal Day” in California and provides the people of our state an opportunity to recognize the achievements, contributions, and history of this vibrant community,” said Senator Tony Mendoza. “It’s a great privilege and pleasure to be in Sacramento to witness the passing of SCR 130. The measure is a fitting tribute that makes us all very proud of the longstanding contributions and achievements of the Portuguese American community in California. I would like to express my gratitude to the Honorable Tony Mendoza for spearheading this meaningful and befitting resolution,” said Consul General of Portugal in San Francisco, Nuno Mathias. In Portugal, June 10th is celebrated annually as “Portugal Day”, officially known as “Dia de Portugal, de Camões e das Comunidades Portuguesas” (Day of Portugal, Camões, and the Portuguese Communities). Although officially observed only in Portugal, Portuguese citizens and members of the Portuguese diaspora celebrate this holiday. The date commemorates the death of national literary icon Luís Vaz de Camões on June 10, 1580. Luís Vaz de Camões wrote Portugal’s national epic poem “Os Lusíadas” celebrating the fifteenth century Portuguese explorations that brought fame and fortune to the country. The poem is considered one of the finest and most important works in Portuguese literature and has become a symbol for the Portuguese people. Added Senator Mendoza, “In California, Portuguese Americans are an integral part of our state, having made great contributions in the fields of agriculture, finance, technology, law, medicine, education, sports, media, the arts, the military, and government. It seems fitting that June 10th, 2016 also be celebrated as “Portugal Day” in California. Currently, there are more than 350,000 Portuguese Americans residing in California. In 1870, Portuguese immigrants began arriving in the United States in relatively large numbers. At the time, the majority of Portuguese immigrants were from the Azores, and were primarily recruited to work on American whaling ships and to be farm workers. Between 1900 and 1940, as much as one-half of the Portuguese American community in California owned or operated a dairy farm, worked on a dairy farm, or worked in a dairy-supporting industry. To this day, Portuguese Americans continue to thrive in the agricultural communities of the Santa Clara and San Joaquin Valleys and also Artesia.